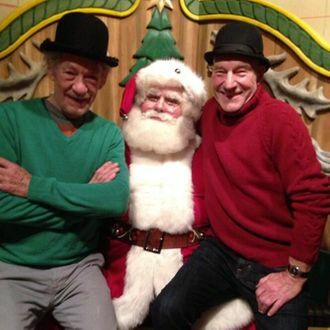 Sirs Patrick Stewart and Ian McKellen continue to hang out like their lives are actually a buddy comedy. Props to the stage (the two are currently co-starring in No Man’s Land and Waiting for Godot at the Cort Theatre) for benefiting from this totally amazing (and totally real!) viral friendship.